SDS, Swedish Design Cooperation, is an informal network of the country’s main design organizations within our various trades . Our starting point is the experience and knowledge sharing, to discuss the design concept and the need for an official design policy for Sweden . One of the early objectives of the SDS was to influence and inform policy makers about the added value that design can create for business and society. Design can profoundly enhance the competitiveness of Swedish industry. Members are Svensk Form, SVID, Swedish Industrial Design Foundation, Swedish Association of Architects, the Swedish Designer , Craftsmen and Designers’ Organisation, KHVC The Craftscenter, The association of Swedish illustrators and graphic designers, KOMM , ASFB (Association for Swedish Fashion Brands), Swedish Fashion Council, Disk – Designer in Skåne. Initial start-up meeting takes place at the end of May 2013. For more information about SDS ongoing work will be published. Some of the world ‘s most influential designers of graphic design , fashion , magazine production and art are flown in to Stockholm for a two-day seminar series packed with panel discussions and conversations. 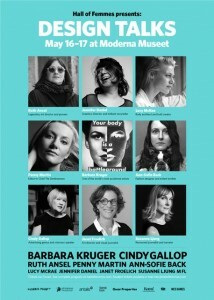 Svensk Form is a partner of Hall of Femmes and parts of the program at Moderna museet is presented by us. Virserums Konsthall arranges a variety of exhibitions, classes, lectures and events under the heading of WOOD 2013. Svensk Form is co-hosting the Architecture of Necessity – An International Triennial for sustainable building . During Autumn 2009 Virserums Konsthall presented an international Manifesto on Architecture of Necessity . For the exhibition in 2010 there was 143 entries from 28 countries and 42 contributions were exhibited. This year 100 projects from around the world will be exhibited. On 26-27 June, it´s time for Smålands Trädagar with a program filled with interesting seminars and discussions. Planned foreign investments in 2013. Details will be published.